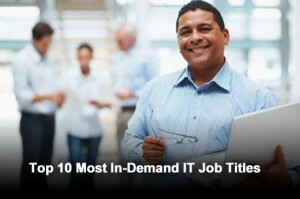 Top 10 Hottest Tech Job Searches for January 2016 | APOLLO STAFFING, INC. 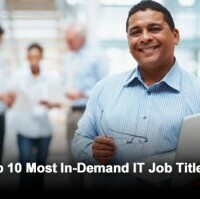 Ever wonder what the top 10 “in demand” tech jobs are at any one point in time? As a technical staffing vendor helping our clients secure top talent for their companies, we live that challenge every day. If you missed our two previous blog postings, we highlighted two recently released studies closely tied to each other. The most recent was a CompTIA study predicting the Global IT Market is expected to reach $3.8 trillion in 2016, with the U.S. expected to contribute $1 trillion towards that amount. A link to that forecast can be found here. Another recent blog highlighted the fact that the DFW market was the top most competitive job market in 2015, of the 160 markets surveyed by Economic Modeling Specialists International. A link to that survey results can be found here. Given the growth of the Tech Market, it is no surprise the race to secure good technical talent has not abated. CareerBuilder recently published a list of the top 10 “hottest job searches” for January, 2016. While these job titles represent an aggregation of the job title searches across the U.S., our experience tells us the DFW market closely mirrors the U.S. trend identified by CareerBuilder. DICE published their January 2016 top 10 most challenging positions to hire for also. 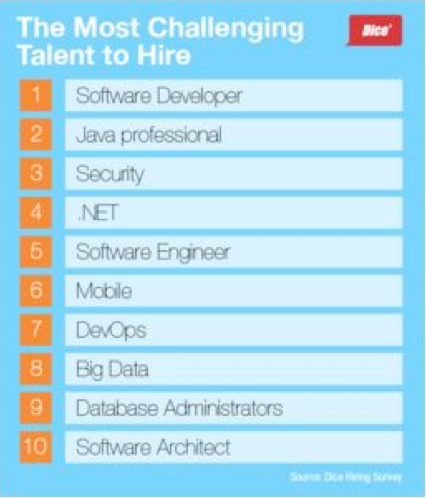 While a bit different from the CareerBuilder results, software development professionals dominate the hot job categories.